MENLO PARK, Calif. – From increasing childhood literacy in India to helping improve the air quality in California’s Central Valley, The William and Flora Hewlett Foundation has announced over $84 million in new grants to 199 organizations. The success of India’s Pratham in improving reading and math skills among primary school children across that country is now leading them to introduce their techniques in higher grades. Photo courtesy of Jeanel Drake, Mango Tree. The Global Development Program, which is dedicated to reducing extreme poverty in the developing world, made $18.2 million in grants to 17 organizations. Most development experts agree that improving education is key to reducing poverty. To that end, the Foundation made two new grants to Pratham USA, the U.S. affiliate of an Indian nonprofit organization that has improved the reading and math skills of 10 million primary schoolchildren in that country. The first grant, for $4.5 million with up to $2 million more in potential matching funds, will be used to extend the organization’s work into higher grades and to begin to institutionalize its effective teaching methods. 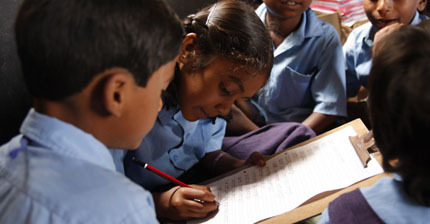 A second grant, for $3 million, will support Pratham’s annual survey of student reading and math skills, which has been an effective tool in garnering government support for education. Toward the Global Development Program’s goal of increasing government transparency and accountability in the developing world, the Foundation made a $1 million grant to the College of William and Mary, in Williamsburg, Virginia, for its AidData project. AidData is an interactive database and online toolkit to research and analyze the flow of the more than $120 billion in funds that reach the developing world as aid each year. The Education Program, which makes grants to improve education across California and around the world, awarded $6.7 million in grants to 28 organizations. After consulting with a broad range of education experts nationally, the Foundation recently broadened the focus of its Education Program. The Program will dedicate a part of its grantmaking to support what it calls “deeper learning” , which include the teaching of critical thinking skills, problem solving, clarity of communication, and project-based learning. To further this work, the Foundation awarded a $400,000 grant to the Alliance for Excellent Education in Washington, D.C., to help develop policies and teacher training that will bring deeper learning to more schools nationally. A second grant, for $250,000, went to the KnowledgeWorks Foundation in Cincinnati, Ohio, to develop online curricula related to deeper learning, while at the same time supporting another goal of the Hewlett Foundation, which is to develop open educational resources. In support of its goal of improving K-12 education in California, the Foundation made an $800,000 grant to SCOPE, or Strategic Concepts in Organizing and Policy Education, in Los Angeles, for a public education effort on the need for education funding reform. The Oakland Interfaith Gospel Choir is a multiracial, interfaith group that regularly performs traditional and contemporary black gospel music and spirituals throughout the Bay Area. The choir works to spread its message of diversity, tolerance, and unity through its music. Photo courtesy of Laura Sandoval and the Oakland Interfaith Gospel Choir. The Performing Arts Program, the largest funder of performing arts organizations in the San Francisco Bay Area, made $5.4 million in grants to 44 organizations. In pursuit of artistic breadth in one of the country’s most culturally diverse regions, the Performing Arts Program made a $90,000 general operating support grant to the Oakland Interfaith Gospel Choir. This multicultural, multiracial music ensemble performs repertoire from the African American spiritual and gospel music traditions. To meet the Foundation’s goal of creating, performing, and preserving exceptional works of art, the Program awarded a grant of $135,000 to the Ali Akbar College of Music in San Rafael. Founded in 1967, the college teaches traditional North Indian classical music as expressed by the late Ali Akbar Khan, considered the preeminent master of this form. With this support, the college plans to continue offering four sessions of training annually at its San Rafael campus, presenting concerts, and digitizing an extensive collection of unique recordings that preserve Khan’s legacy. The Philanthropy Program, which awards grants to promote effective charitable giving, made $2.2 million in grants to 18 organizations. Among these grants is $800,000 for general operating support to the Bridgespan Group of Boston, Massachusetts. Bridgespan is among the most influential management consulting firms serving U.S. nonprofits, having used their practical experience working with nonprofits to produce reports on strategy, leadership, and finance that are now standards in the field. A grant of $300,000, also for general operating support, went to Philanthropedia, a start-up advisory service that interviews experts knowledgeable about various philanthropic causes and shares their advice about which nonprofit organizations are having the greatest impact in their fields. Héctor García and his son in front of El Camino Real Elementary school, where Garcia’s son is a student. The Center on Race, Poverty & the Environment, a Hewlett grantee, helped local community groups win stronger restrictions on the use of pesticides around schools like the Garcías’. Photo courtesy of Gustavo Aguirre of the Center on Race, Poverty & the Environment. The Environment Program, which makes grants to protect western lands and address the problem of climate change, announced $24.9 million in grants to 47 organizations. A highlight of these grants is $500,000 to the Health Effects Institute in Boston, Massachusetts, for a project to conduct scientific research on the health effects of air pollution and to share the results with policymakers and the public. A grant of $170,000 went to the San Francisco-based Center on Race, Poverty & the Environment for its work to improve the air quality in California’s Central Valley as a way to improve public health and the environment. The Population Program, which makes grants to improve family planning and reproductive health in the United States and around the world, gave $21 million in grants to 19 organizations. Among these are grants to four organizations that offer a range of high-quality family planning and reproductive health care services in sub-Saharan Africa and other regions of the developing world: EngenderHealth, based in New York City, $1.25 million; Pathfinder International, of Watertown, Massachusetts, $1.75 million; PATH, of Seattle, Washington, $1.25 million; and DKT International of Washington, D.C., $1.3 million. When a suitable opportunity arises, the Foundation occasionally makes grants beyond the scope of its individual programs. Sometimes these fund collaborations across Hewlett programs, but they can also support other promising philanthropic activities. In March, the Foundation made $5.8 million in grants to 33 special projects. Among these is a $750,000 grant to the Washington, D.C.-based State of the USA. With the recognition that the United States can manage only what it can measure, this bipartisan organization has brought together leaders from academia and industry to create a common set of measurements to assess the nation’s progress. This grant will support State of the USA’s current work to create measurements regarding health care, among other activities. A full list of Hewlett Foundation grantees, along with links to their websites, is available online.